The way human beings become fluent in a language is through immersion. That's the way you acquired your first language. You were immersed in it and your brain automatically learned. The process was completely effortless on your part - in fact, you had no choice in the matter. Until now, the most common way for Spanish students to become fluent was to spend an extended period of time in a Spanish speaking country interacting with the local people (i.e. immersion). That's what Spanish language majors at universities do. Classes, tutoring, books, CD's and computer programs all help, but to achieve fluency with all its benefits requires immersion. The obvious fact that all human beings become fluent in their native language (with extremely rare exceptions) is enough to tell us that we are 'wired to learn language'. Some people may like learning languages more than others, but we all became fluent - and we did so without needing to study or work at it. Acquiring language is so fundamental and easy (under the right conditions) that hundreds of millions of people around the world are fluent in more than one language. So if intelligence and study are not necessary for learning a language, what is? Our human brain is wired to learn automatically, but what it learns and how easily and fast it learns depends on several conditions that we're pretty sure you don't yet understand (otherwise you'd probably already be fluent and would have no need to visit our web page). Those conditions were present when you acquired your native language growing up. Knowing what those conditions are and creating or optimizing them can save hundreds, even thousands of hours of study and can mean the difference between reaching fluency or reaching an elementary or intermediate level and than abandoning further study. "The human brain is powerful, but the brain needs legs"
Our brains learn automatically and rapidly - depending on the environment they're in. We were born into an excellent environment for acquiring language. But as adults now wanting to learn Spanish we are surely not in such an excellent environment. That's why we say, "the brain is powerful, but the brain needs legs". 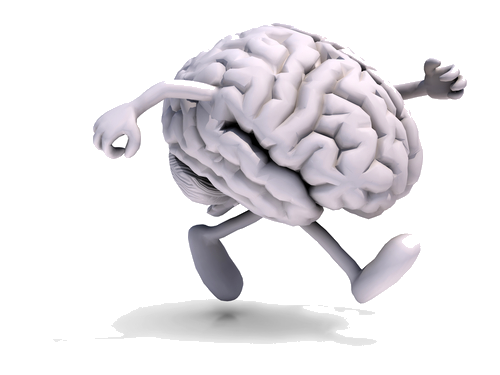 In other words, the brain can't really exercise its power unless it 'moves itself' into a new environment suited to acquiring (the Spanish) language. You, as an adult, function as those 'legs'. The ideal language acquisition environment for adults is not the same one we had as children. When you understand what that ideal (adult) environment is, you can 'walk your brain' into to it and begin to experience your brain's true power to acquire language. So, how to learn Spanish? As an adult, the way to learn Spanish is to understand how to become fluent and then put your understanding into practice. Fluency requires that you have a very large vocabulary - on the order of 10,000 words or more. And you won't get that vocabulary through simple drills, learning games and memorizing dialogs alone. Achieving that kind of vocabulary (plus all the associated grammar and usage 'rules') takes time. When you understand how to become fluent you'll know how to use your time wisely and you'll find that the path to fluency is not really a difficult one. The next section is about Designed Immersion™ - which is a method for establishing and optimizing the conditions that allow adults to progress to fluency as rapidly and easily as possible - regardless of their level or of what classes or programs they have taken or will take. Over the past 30 years we have perfected a method we call Designed Immersion™;. With Designed Immersion™ you get the immersion you need for fluency, but you don't have to move to another country. You can take advantage of Designed Immersion™ in your own home or through one of our classes, or while you are taking a class elsewhere or even while you are living in a Spanish speaking country. Designed Immersion™ will fit into almost anyone's schedule. Terms: 2 payments of $150 *. Payment 1: pays for first year Membership. Payment 2: pays for Lifetime Membership starting with the second year. Cancel at any time. For more information see Cancellation and Refund policy. When you reach Practical Fluency you are able to participate fully in the 'mass culture' of Spanish speaking countries: i.e. you are able to understand and enjoy all Spanish language films, TV, radio, popular books and understand native Spanish speakers when they speak. When you speak Spanish at the level of Practical Fluency you are able to discuss any personal or public topic easily, sometimes making grammatical or usage 'errors', though you will be easily understood by native Spanish speakers. You can expect to have at least a slight foreign accent when you speak. When you are learning Spanish, especially until you get to an advanced level, it's likely that your experience when you try to understand or speak Spanish in real life situations is one of effort - it often feels like work. One of the hallmarks of Practical Fluency is that your speaking and understanding of Spanish has now become automated; it feels effortless. By 'automated' we mean that your brain unconsciously, rapidly and automatically feeds up Spanish to your conscious mind so that you can enjoy effortless communication in Spanish. You now are thinking in Spanish just as you think in your native language when you speak it. We call this automatic, effortless and satisfying experience flow - and it is very close to the flow often referred to by athletes. The words fluency and flow are different forms of the same word. Designed Immersion™ is a method of language instruction based on the research and theories of Dr. Georgi Lozanov, Dr. Stephen Krashen and on our own teaching experience at Pars Omni over many years. At Pars Omni we have taught Spanish and English to thousands of students and delivered dozens of language programs for companies and government departments in the United States, Canada, Mexico, Malaysia, Japan, South Africa and Austria. We worked directly with Dr. Lozanov for many years and we're very familiar with Dr. Krashen's theories as well. 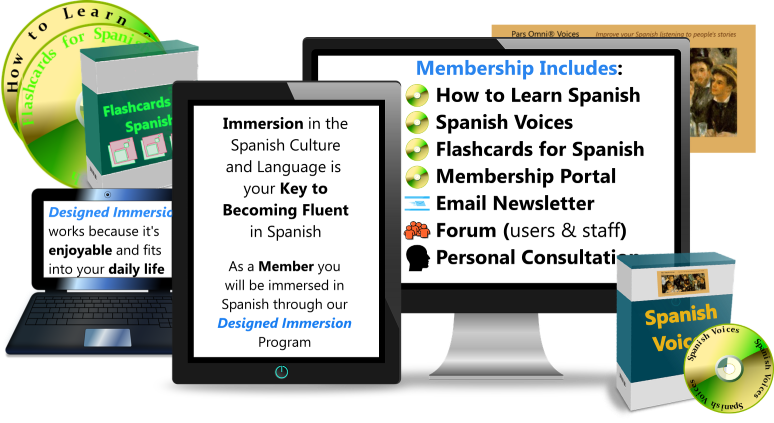 All of our classes are delivered by instructors trained in Designed Immersion™ and our latest offering (the Spanish Fluency Membership) includes a special training for Members in Designed Immersion™. Professor Georgi Lozanov, M.D. 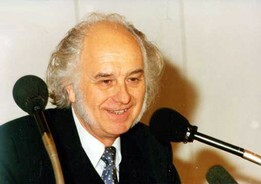 (1926 - 2012) was a Bulgarian psychiatrist and psychotherapist, brain physiologist and educator. He created what he called the science of Suggestology and its application to education – Suggestopedia. Suggestology is "the science of tapping man's reserve capacities in the sphere of both mind and body". He developed teaching methods and materials for adults and children in Bulgaria during the 1970's. By 1978 there were 17 primary schools converted to his methodology as well as an adult foreign language institute. His methodology was officially observed by a 25 expert commission from UNESCO in 1978, evaluated as a superior teaching method and recommended for application all over the world. You can read the Working Document for the Expert Group here. Stephen Krashen (b. 1941) is professor emeritus at the University of Southern California. He moved from the linguistics department to the School of Education in 1994. He is a linguist and educational researcher. Krashen is well known for his contributions to the fields of second-language acquisition, bilingual education, and reading as well as for introducing various hypotheses related to second-language acquisition, including the acquisition-learning hypothesis, the input hypothesis, the monitor hypothesis, the affective filter, and the natural order hypothesis. All Membership Desktop Apps run on Windows 10 (Windows 8.1 or later). Membership Desktop Apps for Mac are under development. Until those are released you can run the Membership Apps on a Mac through any of several popular methods: Parallels, VMWare Fusion, Boot Camp, and Crossover Mac and others. And in the planning stage are mobile and tablet versions of some of the Membership Apps. 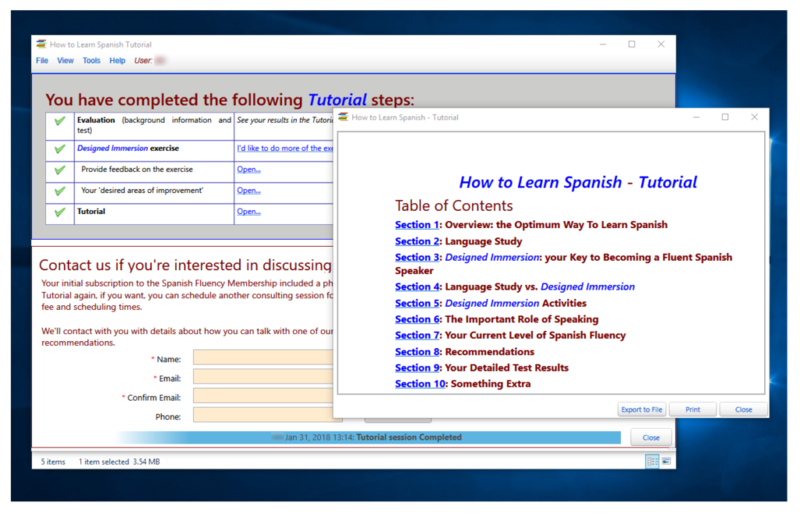 The first important step of the Spanish Fluency Membership is the How to Learn Spanish Tutorial which is delivered to you through the Tutorial app. The Tutorial takes you, step by step, through text, audio and video lessons as well as interactive tests and questionnaires. It trains you to understand and apply Designed Immersion™ in all the Membership activities as well as in any other classes or programs you may take. The Tutorial takes only a few hours to complete but can easily save you hundreds of hours of study time and mean the difference between reaching fluency or not. The Portal app is where you manage all aspects of your Designed Immersion™ program. Here you set goals and track the various activities that are part of your program. And through the Portal you can access all the Membership apps and content. All your data is saved locally and backed up to the Cloud automatically. 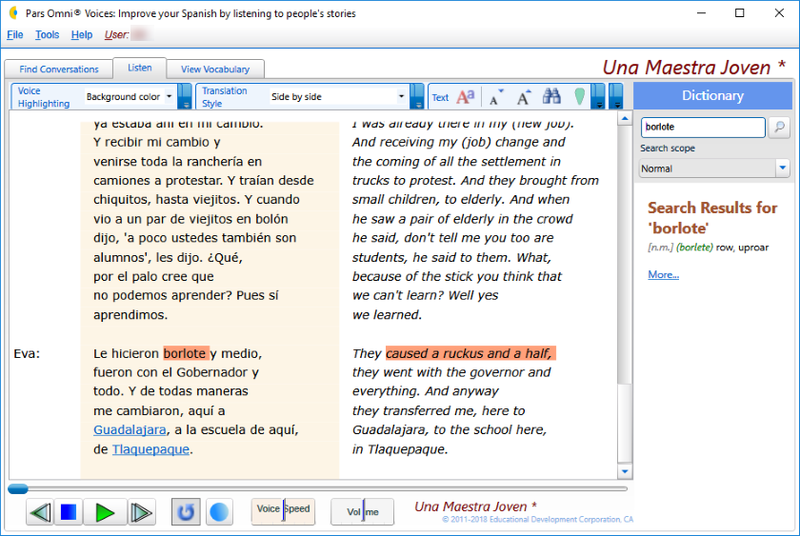 Spanish Voices is a unique application designed to immerse you in the every-day Spanish of native Spanish speakers. It comes with over 100 spontaneous, unrehearsed Conversations and monologues of native Spanish speakers. Each Conversation includes audio, Spanish text, translation and additional notes. Play the audio which is synced with the Spanish text, display or hide the English translation, slow down or speed up the audio, quickly look up words in the built-in Spanish-English dictionary and more. Download specially prepared stories, jokes, music and other content prepared by our staff - and play these ("Destellos") in Spanish Voices. 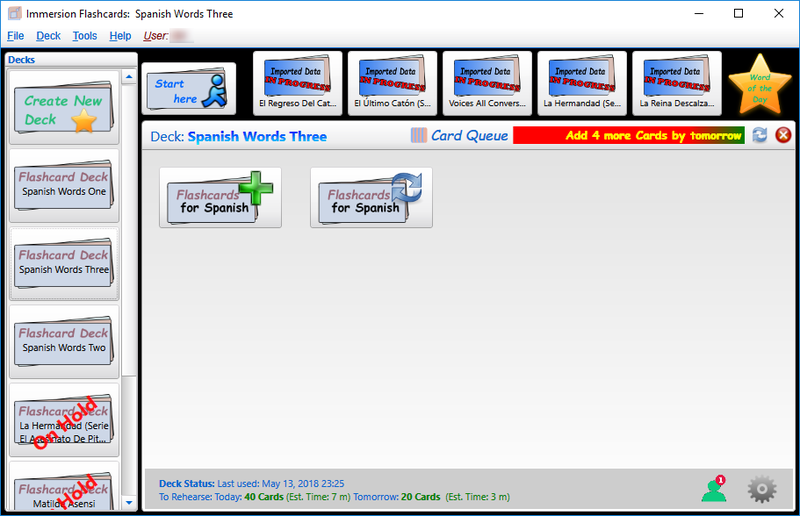 Easily export new words to another Membership program Flashcards for Spanish. You're probably familiar with flashcards - either the ones made of paper or cardboard, or a version made to run on a computer. 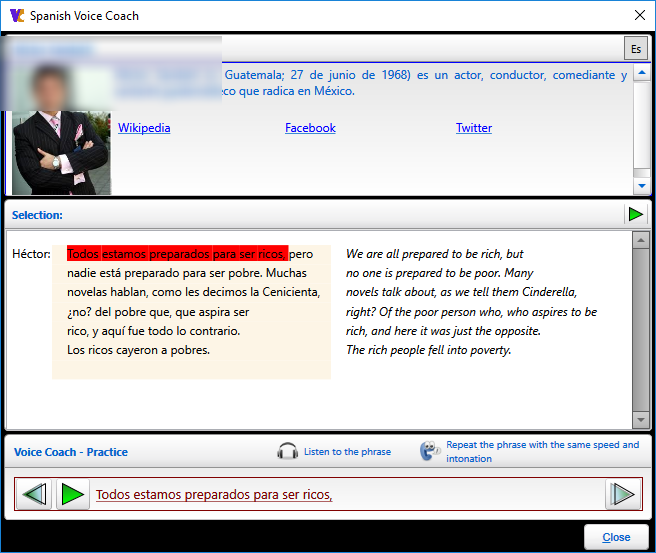 The Voice Coach app helps you improve your speaking ability in Spanish. Most of the time you spend in Designed Immersion™ activities will (and must) increase your vocabulary and your ability to understand Spanish. But you also need to improve your ability to speak Spanish fluidly and with decent pronunciation. The Voice Coach app that comes with Membership helps you in this area. The "coaches" are actually well-known people from the Spanish speaking world. 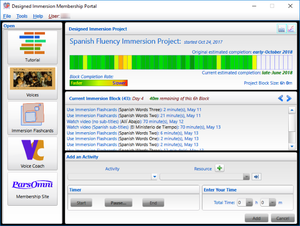 Spanish Fluency Membership is sold as an annual subscription with two payments. When the Member makes the second payment, at the end of the first year, the subscription becomes permanent and requires no further payment. During this first year, a Member may cancel Membership which will end further billing and also cause the Membership to become inactive after the first year. Phase 1: starts when Membership starts. The Member then downloads the Membership Desktop apps and completes the Tutorial using the Tutorial app. The last step of the Tutorial requires that the Member request a phone consultation appointment with a Pars Omni instructor. The request for appointment marks the end of Phase 1. Users are entitled to receive a 50% refund of the first-year subscription fee when they request a refund during Phase 1. Phase 2: Phase 2 begins when the Member begins the phone consultation and ends when the instructor grants the Member access to all of the Membership apps and content, which usually occurs within two days of completing the phone consultation. When a Member requests a refund during Phase 2 they are entitled to receive a 35% refund of the first-year subscription fee. Phase 3: starts when the Member when the Member is granted full access to all the Membership apps and content and ends with the end of the first year of Membership. There are no refunds for Phase 3 requests for refunds. Phase 4: starts with the start of Year 2 of the Membership. A Member is entitled to a 75% refund of the second-year subscription fee when they request the refund within 10 days of the second year billing transaction. Requests for refunds must be made by email request to Customer Support and refunds will be remitted by check or credit card within 45 days. Can you Afford the time? Once you are trained, Designed Immersion™ will provide you a sure path to fluency (assuming you are at least 14 years old and have no brain impairment). The one thing it does require - that is in your control - is your time. We recommend that new Members commit (to themselves) to spend 5.5 hours a week on Designed Immersion™ activities. You can start with a commitment as low as 3 hours a week or as high as 15 hours a week. 2. The value you put on those 5.5 hours a week. If you feel you are not making any progress, the value goes down to zero. If you believe you are not making enough progress or that progress is too slow, the value goes down. If you find that your experience is one of boredom or of struggle and effort or of 'sacrifice' it's likely that you'll find many other things in your busy life that need attention and it will be difficult to find the time to pursue fluency in Spanish. If, on the other hand, you experience those 5.5 hours as thoroughly enjoyable, even entertaining and, after a while, you start to notice significant progress, and you eagerly look forward to your Designed Immersion™ sessions, then you will value those 5.5 hours a week very highly indeed. Most people (including us) are not willing to devote 5.5 hours a week on an ongoing basis to studying Spanish in the conventional way. Designed Immersion™ is not the conventional way. If you've read this far, it's very likely that you do value becoming fluent in Spanish. And in ​the Designed Immersion™ training you'll learn how (and how easy it is) to make your Membership time highly enjoyable and satisfying. Just as it was inevitable that you become fluent in your native language (as it was with virtually everyone you know), Designed Immersion™ shows you a path to fluency in Spanish that is also inevitably successful. During the training you'll learn all about this important point of 'your inevitable success at reaching fluency in Spanish'. Once you start the Designed Immersion™ Membership, the only thing that can keep you from reaching Practical Fluency is not putting in your time on a regular basis. And the only way for any of us to be willing to devote several hours a week - indefinitely - to anything is that we must find that time to be very valuable and rewarding (e.g. like an enjoyable hobby). The success of Designed Immersion™ is grounded on this premise. 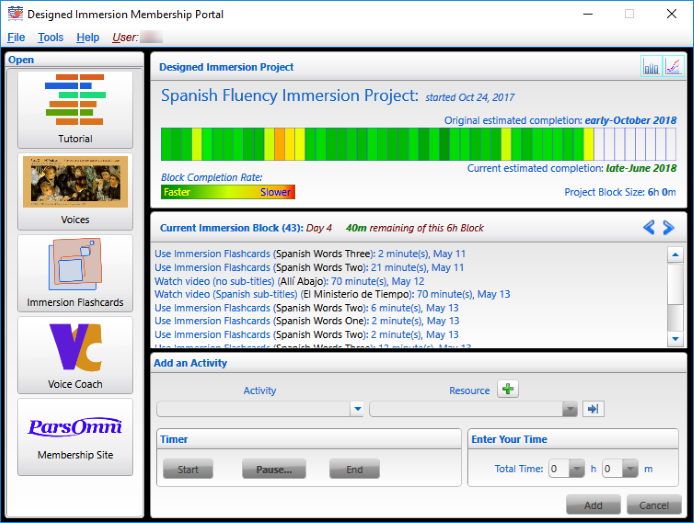 Spanish Fluency Membership is almost ready for release. We have a few finishing touches to add to the Tutorial. We anticipate going live soon (sometime in September 2018). If you would like to subscribe to Spanish Fluency Membership, please send us a brief e-mail request with your name and e-mail address. We'll contact you as soon as the Membership is released.